Our Cooling Tower Company History | Manufacturers of Cooling Towers & Systems | Delta Cooling Towers, Inc.
Manufacturing Cooling Towers for Over 45 Years! With administrative offices in New Jersey and our manufacturing facility in West Virginia, Delta Cooling Towers is proud to make our products in the United States. Founded in 1970, Delta Cooling Towers was the first company to manufacture a seamless, non-corrosive, polyethylene cooling tower line with the introduction of our Pioneer Series. During the late 1970s, Delta benefited from corporate ownership which invested in new molding technology. With this new leadership, Delta introduced a new line called the Paragon Series Induced Draft Cooling Towers. This brought our single non-corroding cooling tower capacity up to 250 tons. Following the momentum of new products, Delta entered the air stripper market in 1981 and currently markets a standard line of VANGUARD® packed column air strippers from 1′ through 5′ diameter. Larger custom designed systems can be provided up to 15′ diameter. Air Stripping Equipment removes Volatile Organic Compounds from water for Municipal and Industrial Projects. Delta has more than 500 installations since then. 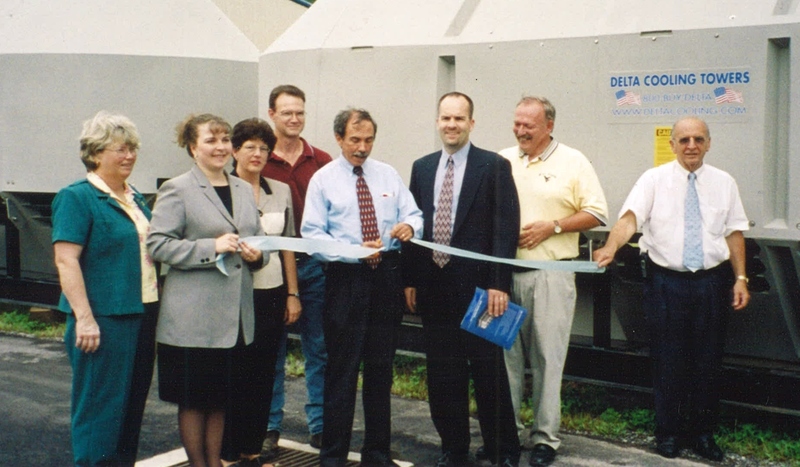 In 1998, Delta rolled out the new Premier Induced Draft Cooling Tower, which doubled the single module capacity to 500 tons. Shortly after that, Delta introduced the TM Series which allows the banking of up to six cells for single module capacity to 2,000 tons. Our Delta Cooling Towers Facility relocated from New Jersey to West Virginia in January 2002 to a 35,000-square foot manufacturing floor space with 4.5 acres of outdoor storage and staging space. This allows Delta Cooling to handle all HDPE cooling tower rotational molding, thermal testing capabilities, and thermoforming equipment to produce Delta Pak and Mist Eliminator products. Delta continues to expand and add product offerings. In 2016, Delta added Anti-Microbial cooling tower options. Delta is the first cooling tower company to implement a product solution to help prevent the potentially deadly Legionnaires' Disease.